July 12, 2010 - no comments. Posted by Larz in Suckpax 1. Now that all the various cards and inserts are ready, we sort out which cards go into each box. 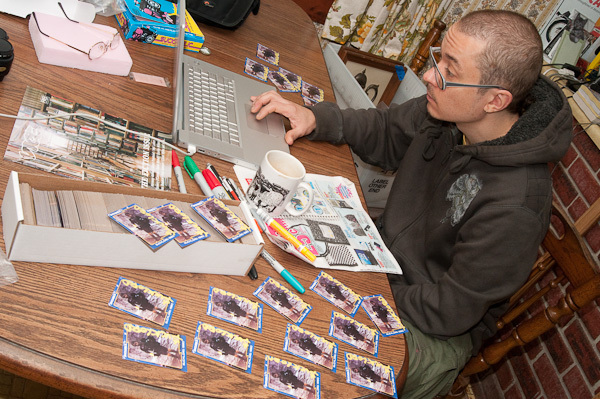 This is the opposite of what many collectors do, which is to open up a batch of packs and then sort the random cards into stacks of teams, or of the same card. 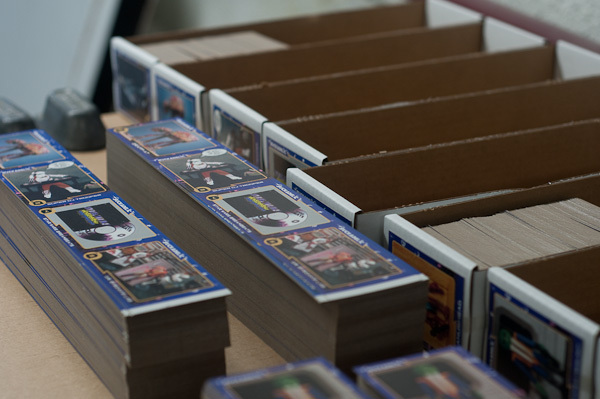 Here we are taking a handful of identical cards and dealing them out into stacks that will be the contents of a box. 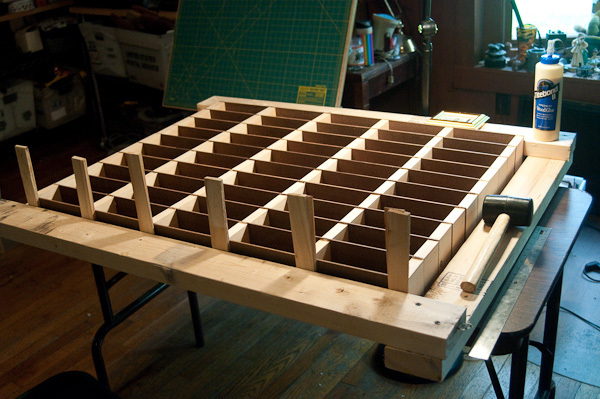 I built a pair of these 50 slot “mail box” cases. In hindsight, I should have made them only 25 slot. With 252 cards per slot, the total weight when full is about 90 pounds. 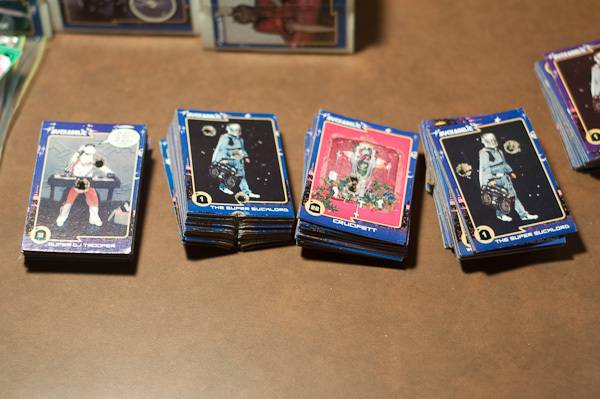 I built them before I had actual cards, but I could have weighed a stack of cards from my collection. July 8, 2010 - no comments. Posted by Larz in Suckpax 1. Certain cards were deemed to be made “scarce”. Four different base cards were selected to have fewer exist than the rest of the base set, and the three different chase cards were also reduced in quantity. I suggested burning them, to ensure scarcity, and we proceeded behind the SideKick Lab facility to make a campfire and begin operation scarcity. I was tending the fire, and a few half-burned cards fluttered out of the flames. The Sucklord began picking them up to tuck back into the fire, and I saw a light bulb switch on over his head. “These have got to go into the packs!” he said. 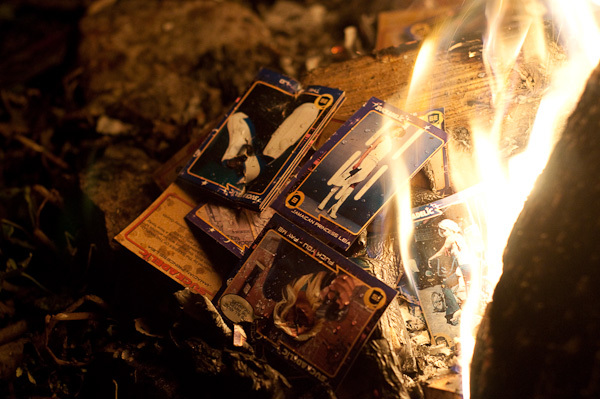 We imagined the WTF moments that would occur as collectors opened packs and found burnt remnants of rare cards in their hands. They might think that there had been a fire at the packaging plant, or some kind of sleazy carny working in the assembly plant might have used a card to light his stogie, then tucked it into a pack to hide the evidence. July 7, 2010 - no comments. Posted by Larz in Suckpax 1. 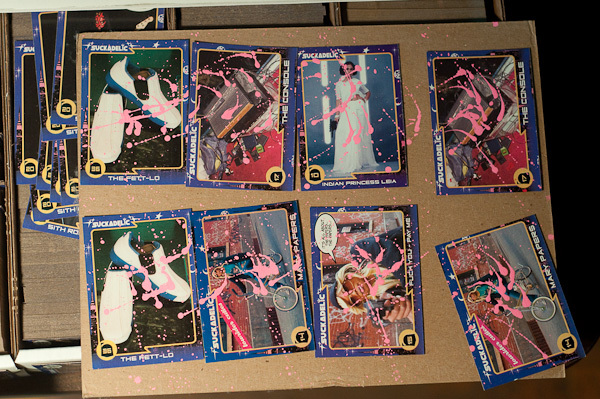 First came “splatter” cards. 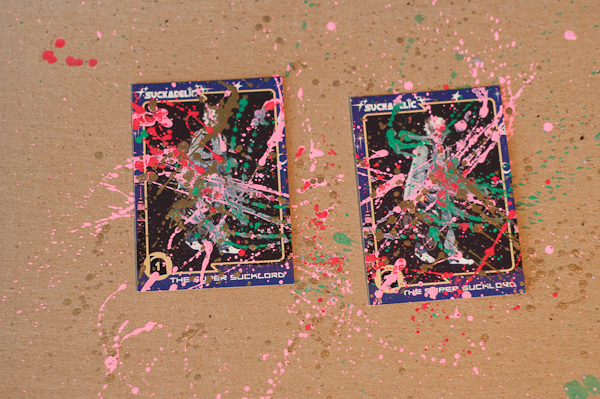 The Sucklord selected small batches of cards from the base set, and hit them with paint in his own style. 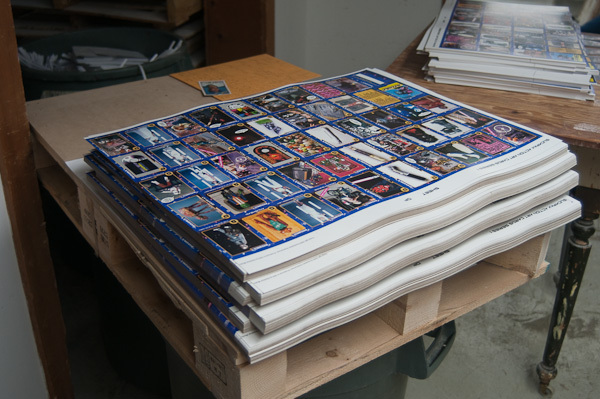 Pushing the concept further, small stacks of base cards were wrapped and shot with a .38 caliber pistol. Video of this was featured on Suckadelic.com. June 30, 2010 - no comments. Posted by Larz in Suckpax 1. 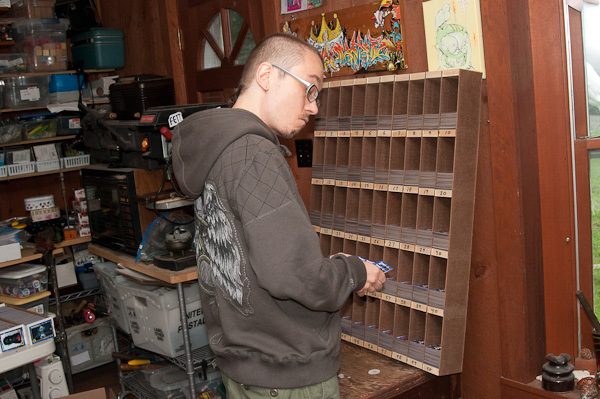 The Sucklord signing cards for each box. Taking a break from the hard work, he is shocked by what he sees on Ebay. June 29, 2010 - no comments. Posted by Larz in Suckpax 1, Trading Cards. Found some pictures of slicing the sheets up into individual cards. There are 50 cards to a sheet, and first task is to slice the sheets into strips, then into individual cards. I had a row of card boxes prepared to receive cut cards. A sample of each card was taped to the end of the box. This is very handy for managing the cards later, not having to open every box to find a certain card. The first edge has been sliced off of these sheets.